As part of the agreement, Tile Mountain’s branding will also appear on a wide variety of the club’s inventory. 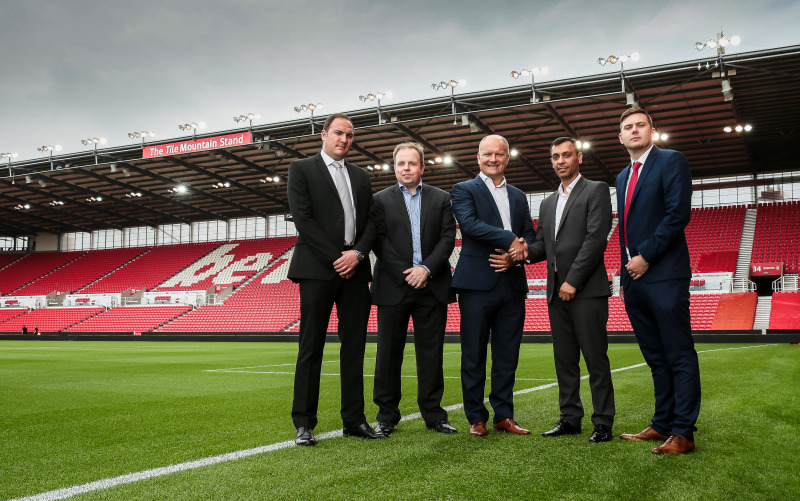 Based in Stoke-on-Trent, Tile Mountain was formed in 2012 by Mo Iqbal, Jeremy Harris, and Nick Ounstead and has since forged strong links with the football team, known as the Potters. Tile Mountain is the UK’s fastest growing tile retailer with both an ecommerce and traditional retail presence. The firm’s proposition of offering free cut samples to prospective customers has seen the company enjoy substantial growth since its inception, culminating in relocation to its £10m purpose built 120,000 sq ft warehouse, showroom and office complex in Tunstall in April of last year. Due to the success of its flagship store, Tile Mountain is expanding its retail estate and embarking upon a roll out of nine further stores at key location across the UK, the first of which opened last month in Greater Manchester. Chairman Mo Iqbal recently told DIY Week he believed the business could set its sights on 15 showrooms across the UK in order to reach 80% of the customers it would like to target.